Nori is traditionally used with for sushi or onigiri, but also serve as a garnish or provide flavor in soups and noodle dishes. Our Laver 'Wild Atlantic Nori' is hand harvested from the clean waters off Maine's coast, dried, and sold as a whole plant (not in sheets). Of all Maine sea vegetables, Laver is the highest in B complex vitamins, C, E and vegetable protein. Also rich in calcium, iodine, iron, phosphorus, potassium, maganese, copper, zinc, and vitamins A and K. Large amounts of this seaweed can be enjoyed. 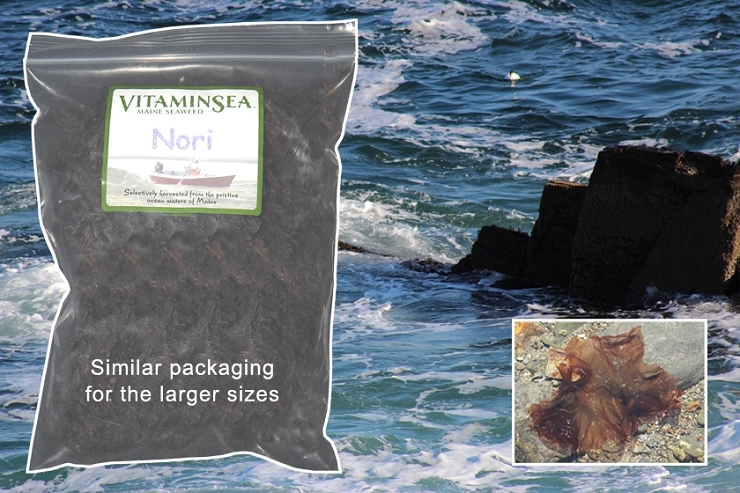 Laver, also known as Nori, is tremendously versatile! It is good in salads, soups, and snacks, or can be eaten right out of the package, soaked, or cooked. Fresh laver is wonderful alongside noodles, grains and vegetables. As well as used as an ingredient in soups, stews, casseroles, even pesto! Our Laver (Wild Atlantic Nori) can be added to desserts for extra depth of flavor and texture, and it pairs wonderfully with chocolate and ginger!